Alpine Alyssum is a medium growing perennial. It blooms from mid spring to early summer with golden yellow, fragrant flowers that cover the entire plant. The leaves are a grey-green. It will grow to a height of 6" to 8" tall and 12" to 18" wide forming a mound. 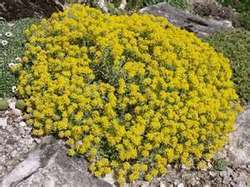 Alpine Alyssum likes to be planted in full sun and dry, well drained soil. Use Alpine Alyssum in a Rock Garden, Cottage Garden, Moon Garden, as an edging plant, ground cover, or in hanging baskets and containers. Trim to shape after flowering, cutting back to maintain a compact form. Alpine Alyssum attracts butterflies and bees when in bloom. It is drought tolerant once it becomes established and is deer resistant too.